The resurrection of Scenic Hot Springs has been a great success story. Scenic has an intersting history. It was destroyed by vandals and closed for a long time. Since it is private property, the owners require people to ask permission to soak there. 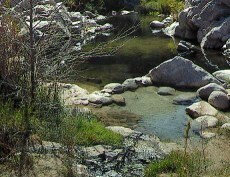 I highly recommend participating in one of the Scenic Hot Springs work parties for cleanup. Contact Rick (bangedupshins) for details. Edited 1 time(s). Last edit at 07/14/2013 12:52PM by Paul P..